Hockey Plumber: Jim Balsillie's New Introduction? Late Tuesday evening the phone rang, and even though the number was not familiar, the call was answered. Calling from his Blackberry was PSE attorney, Jeffrey Kessler! There was a stunned silence… the room spun, seemingly faster and faster as each nanosecond passed and before another word could be spoken, the alarm clock began to pulse ever more loudly. As a demonstrative swipe was made at the evil noisemaker, a sparkling glimmer emerged from the lower edge of the covers. The sheet and blankets were pealed away to reveal a pair of spectacular ruby slippers! Now whether Dorothy or Toto, or whomever actually did in fact, introduce Mr. Balsillie to Patience, or to it’s twitchy cousin, Desperation, cannot be confirmed. 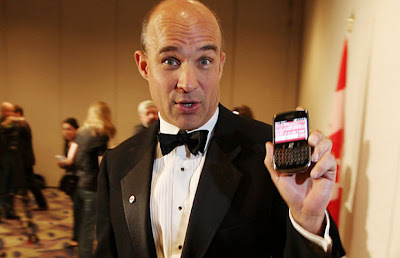 What is now clearly evident is that Jim Balsillie has taken away all the outs. His bid satisfies the creditors, the city of Glendale, keeps the team there for the upcoming season, and allows a significant window for an alternative, local buyer to adhere to the NHL’s relocation policy. With all that is provided in PSE’s newest offer, should the NHL oppose the bankruptcy court awarding Balsillie the bid now, they will be hard pressed to justify their position. The Board of Governors should be moving to decide on how to weigh Toronto’s and Buffalo’s share of a potential relocation fee. Could you please make your posts LESS interesting to read. I've become addicted!! DiRienzo... this post is about TUESDAY night! That's all well and good but the auction closed 12 days ago. It's too bad that Balsillie still doesn't satisfy any unsecured creditor who didn't collude with him in this endeavor. After paying Glendale and the secured creditors there isn't enough in his bid to pay his co-conspirator Moyes. SOF Investments the biggest creditor owed money by the Coyotes would receive all $80 million it is owed under Balsillie's bid. Yet, I am with you Brian, Moyes should not get a cent, and that $100 million should go to all creditors owed.